Ah, pizza! It’s one of America’s favorite foods. Just the thought of pizza sizzling in a hot oven activates almost anyone’s taste buds. You can pick up a frozen pizza in a dollar store or bid on a gold-dusted variety at a highbrow charity auction. They’re all over. And so is the quality. Some say pizza is pizza. Chef Shaun Wolf sees it another way. He makes Neapolitan-style pizzas at Artisans & Oak, his stand at the Markets at Hanover, aka the Amish markets, at 1649 Broadway in Hanover. Wolf’s a stickler for traditional cooking values like using fresh, natural ingredients. His pizzas are made with dough he has proofed, mozzarella he has pulled, and sauce he has made from scratch. If he doesn’t make it, he finds someone who does and gives them credit. His 900-degree oven is wood fired and Wolf burns only oak. “It adds a smoky flavor,” he says. “There are variables with every ingredient and with the oven,” he adds. For this chef, it’s an irresistible challenge to harness those variables and produce outstanding food. Wolf started cooking in a wood-burning oven as a student at The Restaurant School at Walnut Hill College in Philadelphia. 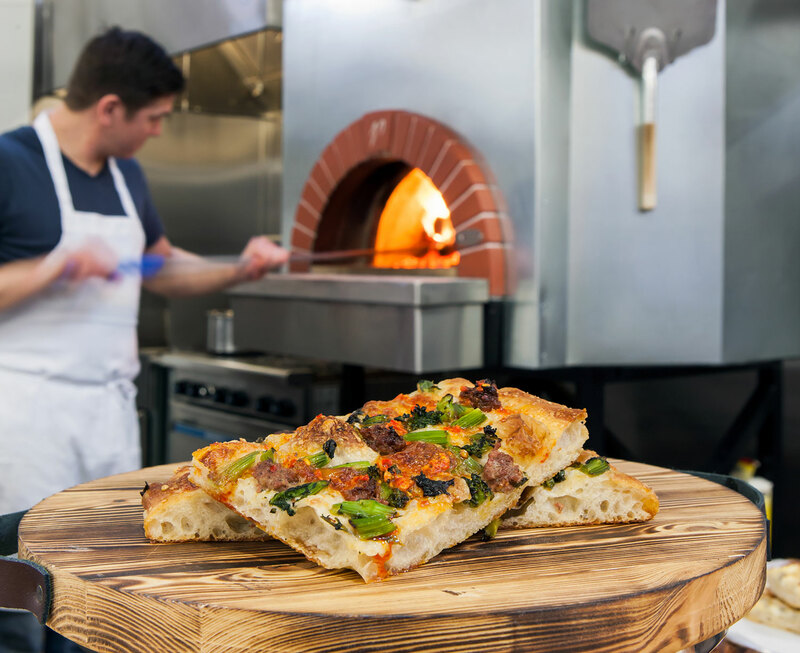 His stints working on the opening crews of both Osteria and Zahav restaurants in Philly, each with wood-burning ovens, intensified his interest in oven cooking. He was hooked by the time he took a job at Pomona’s Woodfired Café, a Biglerville restaurant (now Fidler & Co. Craft Kitchen) with a wood-fired oven. At Pomona’s Wolf explored and expanded his expertise. “Pomona’s was his first real job after culinary school,” says his wife, Jess. Before they decided to open their own place, he brought his skills to Camp Hill and Carlisle restaurants and partnered in a taco stand. Jess’s background in accounting and degree from the Pennsylvania School of Culinary Arts make them a strong team. Shaun explains that a stand, rather than a restaurant venue, allows them to test the waters without a huge investment. In addition to assisting her husband with the pizzas, Jess, a baker, is focusing on ways to develop sweet recipes with their dough. “Our dough is so light and versatile we want to make just the right things with it,” she says. Their Neapolitan-inspired pizza crust is thin. The dough rests or is proofed for 24 hours making it particularly pliable and soft. They don’t toss it, but do stretch it, creating rolled edges which blister and char in the oven. Some of their toppings are surprising. Imagine a pizza with a tossed salad on top! That’s the Cotto. The crust is topped with mozzarella, fontina, and prosciutto cotto. After three minutes in the oven it’s topped with lightly dressed arugula. A complete meal—nutritious, delicious, satisfying. “There’s nothing like this in our area,” says Jamie Roth of Hanover. “My first look at the menu was a little intimidating,” she adds. All the pizzas have their Italian Neapolitan name. But there is a description in English, and Shaun and Jess are happy to help. All pizzas are 12 inches, enough for two people. Pizza al Taglio, or pizza by the slice, features Roman pizza in rectangular slices with thicker crust. The Quattro Formaggi, or 4 cheeses, has Parmesan, mozzarella, Gorgonzola, and fontina cheeses and is robust. Pizza Margherita, the customer favorite, is the traditional combination of the freshest mozzarella, tasty tomato sauce, and flavorful basil leaves. The blistered crust makes it outstanding! The seasonal menu is punctuated with specials, according to the chef’s whimsy. Check their Facebook page for the latest surprise. One offering, Pizza Fritte, bits of fried dough that resemble puffy little pizzas filled with mozzarella and topped with a dollop of sauce and sprig of basil, is a scrumptious treat. “It’s nice to see people really embracing our food,” says Jess. “We are always researching and working with our ingredients to create the best we can,” says Shaun. To be creative enough to keep themselves interested, but not too creative to drive customers away, is one of their goals. “We like taking our ideas and turning them into food people enjoy,” says Shaun. Roth, once a stranger to their style says, “I won’t go anywhere else for pizza!